This year’s allergy season has no chill. I’ve thrown out my back from sneezing (I’m not even 30! ), and the place where my eyes used to be now feels like two giant mosquito bites. I know I’m not the only one suffering this year, but as Reviewed's health and beauty expert, I’m in a special kind of bind: I have to test makeup almost every day. 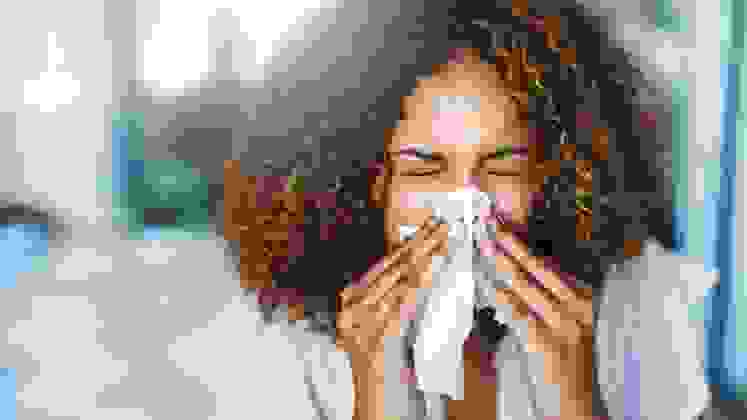 That can be quite difficult when I’m blowing my nose and pawing at my itchy, watery eyes every three minutes. To combat this logistical nightmare, I decided to try the best product on the market for keeping your makeup in place: primer. Primer for your face is exactly like primer for walls. It creates a smooth, even canvas for product to adhere to. Rub primer onto your face and lids and your makeup will glide on like butter and last so much longer. Primer keeps makeup locked in place, no matter how much you sweat in summer humidity or how much your eyes water during a wedding ceremony (or this nightmarish allergy season). I put Sephora’s top-selling primers to the test. I tried Benefit’s The POREfessional Face Primer ($31) on my face pre-liquid foundation and powder blush/highlighter, and Urban Decay Eyeshadow Primer Potion ($22) on my eyes before applying a full smokey eye with liquid liner and false lashes. Face primer: Does it work? Benefit’s The POREfessional is the most-loved face primer on Sephora. The silky balm claims to blur the appearance of pores and fine lines and helps makeup stay put. Since the formula is translucent and oil-free, it complements all skin tones. 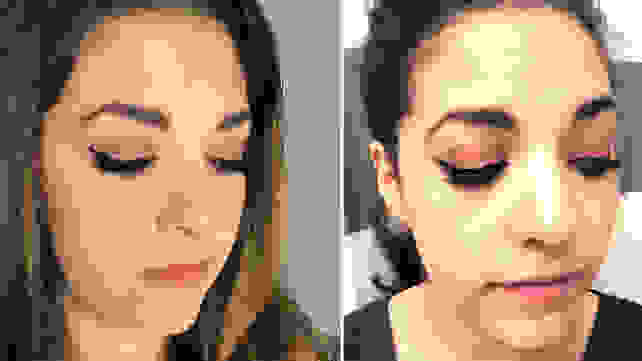 I was blown away by how efficiently The POREfessional smoothed out my face. The formula felt like slippery silk, and it made my pores and discoloration seem to melt away under a supernatural-looking airbrush. The craziest part is that, on the fingers I applied the primer with, my fingerprints looked blurred and filled in compared to the ones that didn’t have primer on them. My makeup didn't budge after 8 hours in allergy season AND a tear-filled surprise party. After application, my face looked like it had been expertly Photoshopped—enough so that I wanted to skip foundation entirely (but, for the sake of this test, I didn’t). I noticed I needed a lot less foundation than usual too: A small amount glided easily over my super-smooth face, which gave a natural finish and even coverage. My face makeup lasted all night. Unbeknownst to me, I tried this primer on a night my boyfriend had planned a surprise party for me. My makeup stood up to the (many) happy tears I shed through the night. Eyeshadow primer: Does it work? 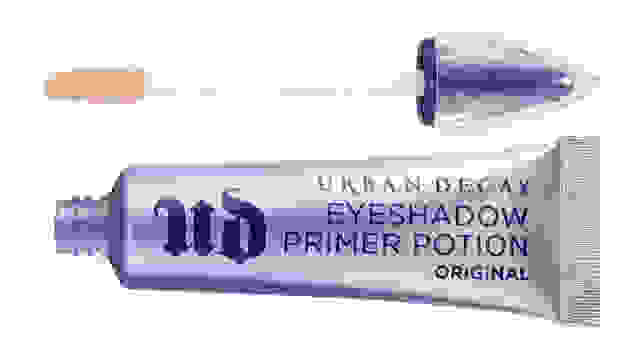 Urban Decay’s Eyeshadow Primer Potion has a crazy-high 4.7-star rating on Sephora. It claims to set a smooth canvas and create a nonstick surface for eye makeup to adhere to. It even keeps finicky shimmery shadows, which are notorious for creasing and melting away through the day, in place for hours. I slicked on the primer and it dried down to a slightly tacky finish: I knew that it was going to grab makeup strongly. The result when I applied eyeshadow was that the color showed much more true to tone on my lid, and it was a lot less blendable, so be careful to place your shadow exactly where you want it. I layered on super shimmery shadows and a not-so-great liquid eyeliner (Maybelline’s Master Precise, which had less than ideal results in our hunt for the best liquid eyeliner). My eyeshadow looked fresh and perfect all night long—not a sign of a crease in sight, which is saying a lot on my hooded lids. At left: A lid coated with primer. At right: A lid with just makeup, no primer. 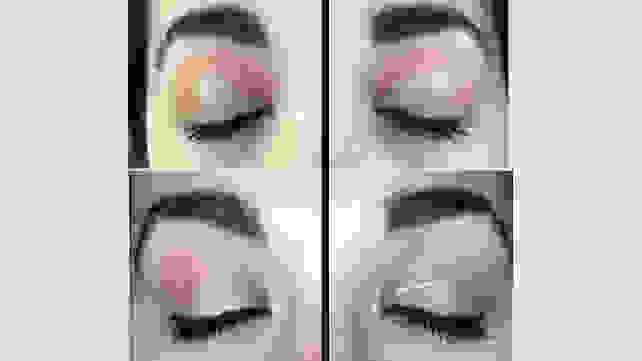 After 8 hours of wear (bottom,) primer prevented shadow from creasing and liner from slipping. The cheap, unimpressive eyeliner was also completely transformed on top of this primer. The color drew on deep, pigmented black, so I didn’t have to trace over it a bunch of times, the line didn’t bleed, and it dried quickly. It didn’t transfer or fade through the day either, despite my many sneezes and tears shed. That means that eye primer can turn a less-than-impressive drugstore product into one that lasts as long as a luxury product. That’s a huge win, and a worthwhile investment.